Sautéed Red Cabbage with Bacon showcases our only edible crop this year, Paul's guerrilla red cabbages. 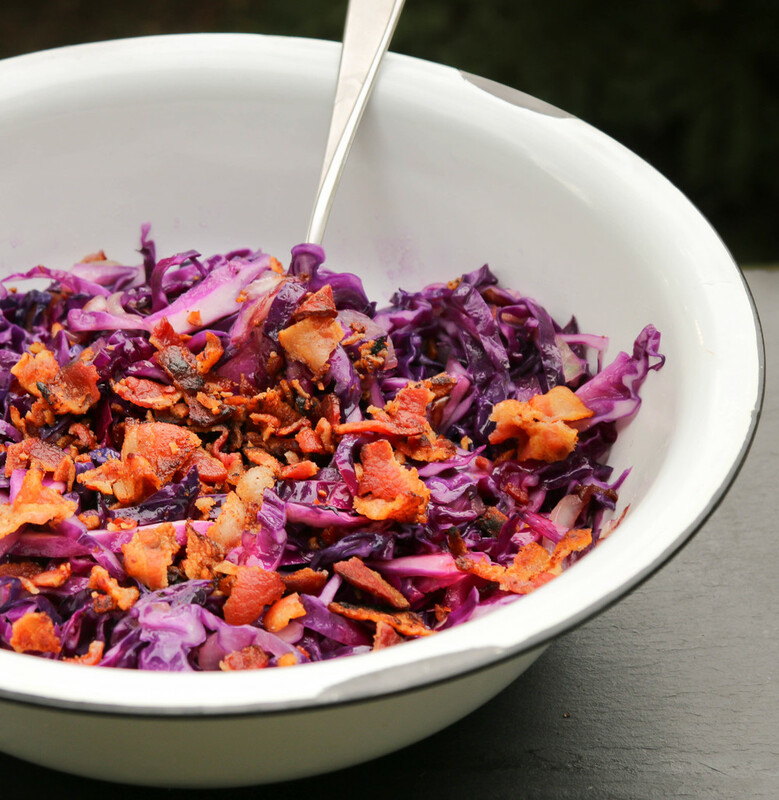 While we do enjoy a good cabbage slaw in the summer months, fall has us yearning for our classic Sautéed Red Cabbage with Bacon, a dish which balances the sweetness of caramelized onions and cabbage with tart vinegar and salty bacon. This spring, Paul surreptitiously planted a mini colony of red cabbages in our front flower garden, nestled between daylilies and daisies. With sunny spots in scarce supply, Paul was adamant that winter was coming...and we needed to ensure an ample supply of sauerkraut and cabbages for the lean months! Cook the bacon on medium high heat in a large skillet (at least 12 inch) until crisp and browned. Set aside to cool on paper towel and discard all but 2 tablespoons of the bacon fat from the pan. If you do not have enough bacon fat, supplement with canola oil. To the bacon fat in your original pan, add the sliced onion and cook over medium heat until golden and soft, about 7 minutes. Add the red cabbage and salt to the onion mixture and cook on medium for 3 minutes, stirring regularly. The cabbage should be just wilted but maintain some crunch. Add the garlic and cider vinegar, stir to combine and cook for 1 minute more. Remove the pan from heat and stir in the pepper and cayenne. Taste and adjust salt and vinegar to your preference, it should deliver a flavor kick! Serve garnished with crumbled bacon. Note: this dish freezes well for lunches and leftovers and is also a great holiday side dish!